Every ten years, the University prepares a Campus Plan which provides the State Government and the community with information on the University’s planning intentions for its Crawley campus. 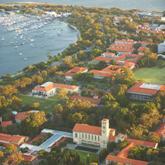 The physical planning of The University of Western Australia is guided by this Campus Plan. The plan is the key tool to guide the University in its decisions on the functional layout and future development of the Crawley campus. The Campus Plan 2010 was released in 2011. Objective One:To ensure there is sufficient land and buildings to accommodate teaching, research and other needs over the next 10 years. Objective Two:To place the University to the best advantage to meet external, often unforeseeable situations, over the next 50 years.